I didn’t find much joy in this. A stellar turn from Lawrence did just enough to keep this mediocre mop yarn watchable. Joy (Jennifer Lawrence) is the story of the title character, who rose to become founder and matriarch of a powerful family business dynasty. A silly opening with a dated soap opera parody didn’t really set the tone or get things going for me. BUT it did give an indication of what to expect. An OTT, patchy and drawn out affair. Jennifer Lawrence was superb and this piece definitely proved one thing. She is one talented actress. She had the charm and presence to carry this biopic along. The endless soap opera sequences were unnecessary. I could get the connection that Joy’s life was like a soap opera. The dream sequence in which Joy became part of the soap would have sufficed. The repetitive use of it just hampered things. Desperate NOT to be like her reclusive mother (Virginia Madsen – Sideways). Shut away from the world and reduced to watching soaps in her room. Madsen did her best with the role BUT she wasn’t given enough screen time or depth to make a proper impression. And that silly little subplot with Jimmy Jean-Louis’ (Heroes) Haitian plumber didn’t help. Bradley Cooper didn’t do too bad in his ridiculously small supporting role. He was able to make such a weak character watchable with his sheer enthusiasm. He even managed to make the history of QVC sound interesting. To be honest, I didn’t know anything about the origins of the renowned TV shopping channel. There were some good little tidbits. The real problem for me was that all this drama was over a mop? 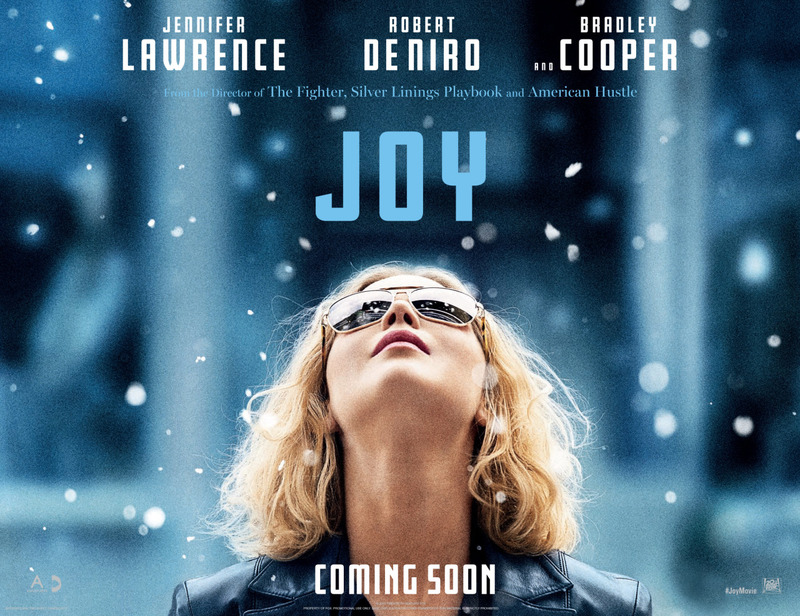 It sounds bad when you say that Joy is a biopic about the woman who invented the miracle mop. Plus you can’t help BUT question how much of this was exaggerated and given the David O’ Russell treatment. As much as we felt for Joy’s struggle to be accepted for something more than just a housewife, there wasn’t much on offer. It wasn’t all bad. There were some engaging moments and if Joy really went through that turmoil then I still wouldn’t believe it. The back stabbing from lawyers, suppliers, QVC and even her own family. There wasn’t enough of Elisabeth Rohm (American Hustle). She was very good as Joy’s conniving half sister. I wanted more of that. The green eyed monster desperate to bring Joy’s empire down from day one. Robert De Niro was on scene stealing form as Joy’s obnoxious father. Arrogant, petulant, a monster. It was a shame that he was pushed into the background by the end after dominating the screen from the get go. Diane Ladd’s Mimi (Chinatown) was a little weak. She was nothing more than a narrator. BUT there were still some nice moments between her and Joy. The only rock in Joy’s hectic life. Isabella Rossellini’s Trudy (Blue Velvet) got on my nerves. Not so much her performance BUT her character. The silly questions she grilled Joy with before investing was stupid. “Do you pick up the gun, Joy?” She picks up the gun, apparently. I’m sure the dialogue sounded better on paper. There were so many different characters thrown into the mix and none of them were really developed or explored enough. Joy’s relationship with Tony (Edgar Ramirez – Point Break) had potential. Faring better as friends than they ever did married. Still standing by her side despite everything. For every high and low, you were still rooting for Joy to succeed (Despite knowing the end result). Especially in the closing act when things came to a head. BUT it helped to have an engaging character and a great actress at the helm. However, I was still left a little disappointed. After all that build up, it just ended. I mean obviously there was only ever to be one outcome BUT it just rushed to tie in everything after throwing several random subplots that went nowhere. Shame. Not O’Russell’s worst. I still enjoyed this a fraction more than American Hustle. Lawrence was on fine form. The supporting cast did their best. BUT the overlong pace and structure made this an uneven and dis-joy-nted piece. Nice review! Love the pun – dis-joy-nted…haha! I wasn’t a big fan of this film either to be honest. It was messy, but Lawrence did a good job! Ha! Thank you. I really wanted this to work. I loved Lawrence BUT O’Russell needs to go back to the drawing board.